What could we choose as a fun activity to raise funds for the Berkshire Craft 2023 Festival? This was not too difficult a task – take a trip to see one of the most successful pieces of entertainment of all time and which has been delighting audiences for nearly 30 years – “Phantom of the Opera”. So on Saturday, 30th. 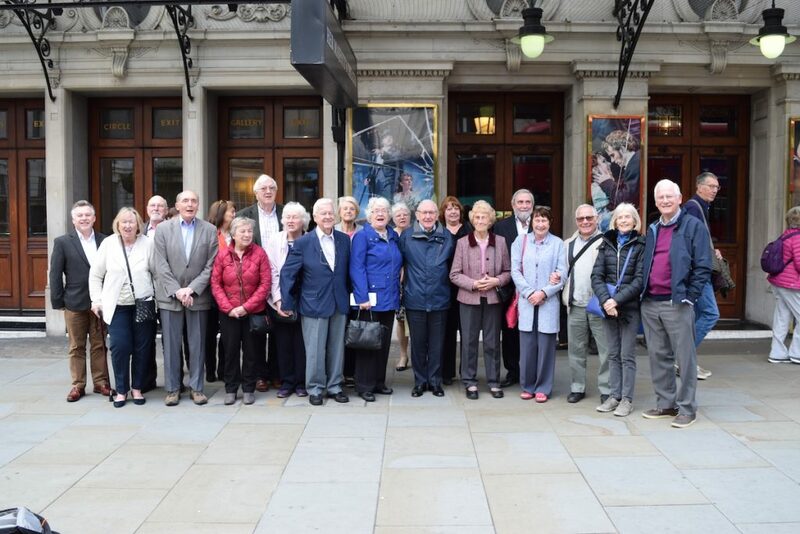 March 2019, under a cloudy sky, a coach with 21 passengers left the west end of the Province to wend its way via Newbury and Sindlesham Court where the second and third pick-ups of theatre goers filled the coach to its maximum 53 seat capacity. Two of the passengers picked-up at Sindlesham were W.Bro. Robin Kent, Assistant Provincial Grand Master, and his wife Julie. By this time, the sway with Him above enabled the sun to shine and provided bright, warm but comfortable weather conditions which required some use of the coach’s air conditioning. On route a fun quiz answering questions about the names of pets and animals, both fictional and factual, was available for those so inclined. On reaching Haymarket in London, the passengers disembarked and spent two hours walking around the West End area, shopping, having a bite to eat or walking around St. James’s Park in the lovely sunshine. It was then time for the theatre goers to congregate at Her Majesty’s Theatre for the wonderful theatrical performance of “Phantom of the Opera”. The colourful, ornate costumes were amazing and the horror side of the story on stage did not detract from the all-embracing atmosphere conducive of telling the story and entertaining the audience. The famous songs of the show were a joy to listen to. Following the show, the coached ferried the day-trippers back to Sindlesham Court when answers to the fun quiz were revealed (to some amusement) and we now all know that the Deputy Provincial Grand Master – V.W.Bro. Peter J. Sands’s dog is called Milo. At Sindlesham an evening meal was provided for those dining and where conversation of the day’s experiences and other interesting topics generated much merriment and laughter. All then went home with fond memories of the event. In all, 56 people attended the Theatre and 50 people dined in the evening. A pleasant and enjoyable day proved a success, raising funds of over £1,100 for the forthcoming Festival. The day was planned, organised and managed by W.Bro. Silverio Ostrowski (of Ashdown Lodge No. 8592) and his wife Katharine who thank the participants for supporting this whole day activity combining fun, a kind of historic anniversary of “Phantom of the Opera and fund raising for the 2023 Festival.